The VT-Hybrid light tower is the first hybrid light tower in the world. It is equipped with 4x150W high efficiency LED floodlights powered by a rechargeable battery pack. This light tower guarantees a great reliability and a perfect sustainability. Mobile version with site-tow or road trailer. The VT-Hybrid provides up to 8 hours of continuous operation without carbon dioxide emissions, fuel consumption nor noise, thanks to the battery pack. The special dry batteries are able to be recharged in less than 5 hours and have a 100% guaranteed charge/discharge cycle of more than 4000 hours. The batteries cab be recharged from either an external power source or from the built-in backup generator. 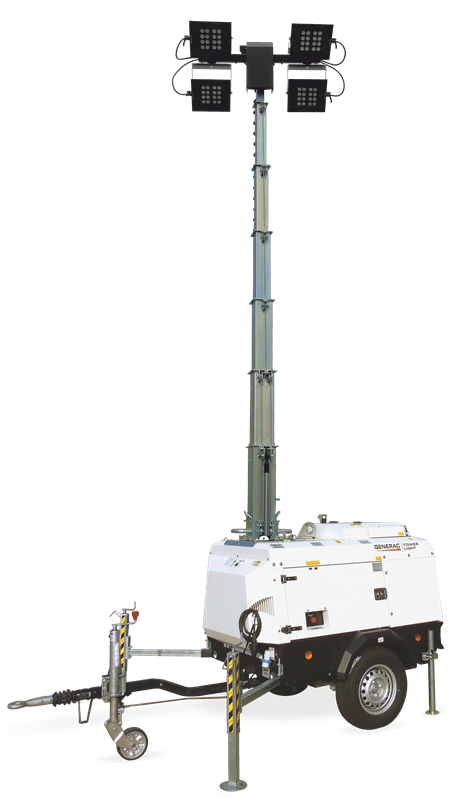 When the VT-Hybrid light tower has utilized all of the stored energy from the battery pack, the diesel backup generator will automatically start, providing all the energy required to power the lamps and at the same time recharging the battery pack. When the battery pack is fully recharged, the generator will automatically turn off. The VT-Hybrid is equipped by a MPnano digital controller studied to manage every function of the hybrid system. LED lamps 4 x 150W high efficiency LED floodlights designed by Generac Mobile®. When the VT-Hybrid is powered through the battery pack, it is completely silent and doesn’t emit carbon dioxide (CO2). An ideal solution for events and working areas with low noise or CO2 emission requirements. Thanks to the hybrid features and the LED lamps, the Vt-Hybrid can run more than 660 hours without refueling. The VT-Hybrid is equipped as standard with a site-tow trailer but as options there are available different types of road trailers with lights, brakes and documents for EU road homologation.